A Saturday afternoon email with the French salutation "Laissez les bons temps rouler!" (Let the good times roll!) identified the top secret setting for a "Diner en Blanc" in the heart of the Circle City last night. 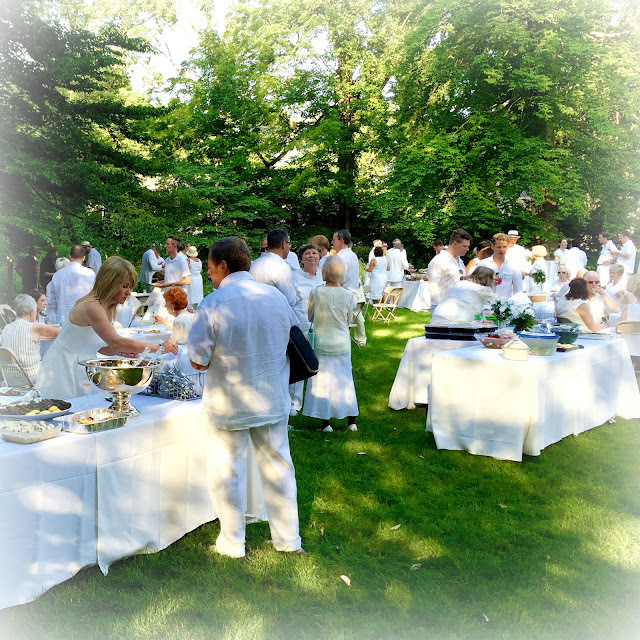 The invitation for the whitewashed outdoor soiree had been extended some weeks prior, as it had the prior year, with instructions to wear white and bring wine and a picnic platter to share. The location, in keeping with Parisian tradition, would not be revealed until the day of the party itself. The concept of "Le Diner en Blanc," more commonly referred to in the US as a "White Party," is French, and originated with François Pasquier, who invited a few friends to the famous Parisian park, Bois de Boulogne, many years ago. 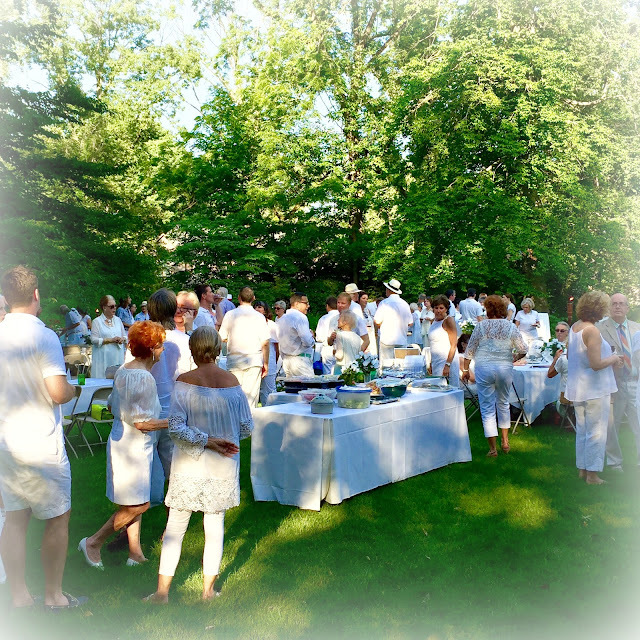 To find each other in the park, the guests all wore white. The dinner was such a success that they decided to recreate it the next year. 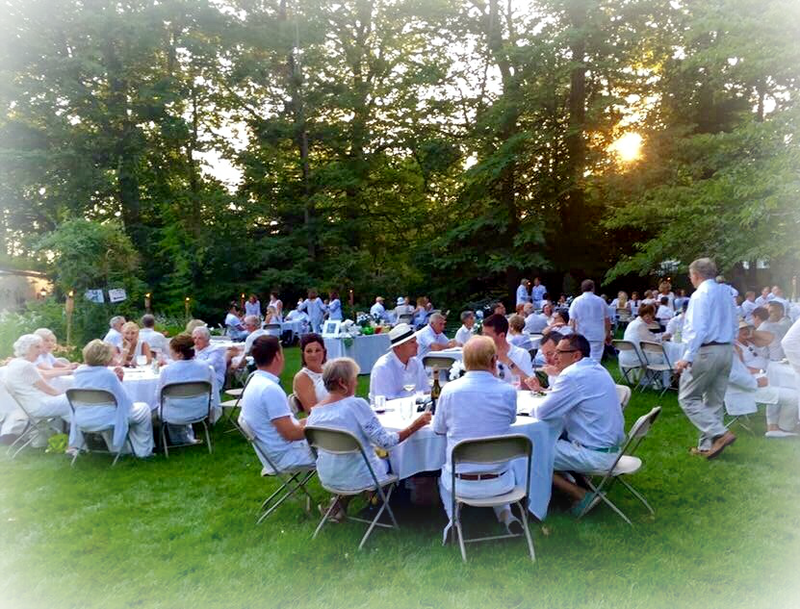 Each person invited other friends and the event grew organically into the 10,000+ dinner it is today. The location is kept top secret until the last minute, though it is always held at a very public (and often historic) locale, such as the Arc de Triomphe. I'm so grateful to our hosts for bringing this traditional City of Light celebration to the Circle City each year. It is always an elegant evening of revelry. Also in true European fashion, it is an evening to relax and slowly savor the smorgasboard of sweets and savories, as well as bubbly and good conversation with chums both old and new. 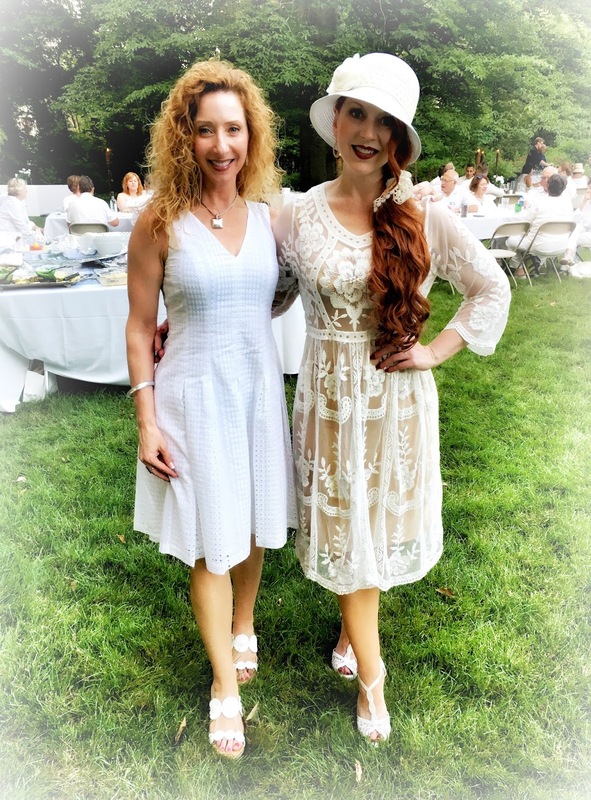 The bright white palette of the decor and the guests' attire was visually striking against the lush green trees and blooming gardens of Dulcinea, an exquisite home in the heart of Meridian Hills. 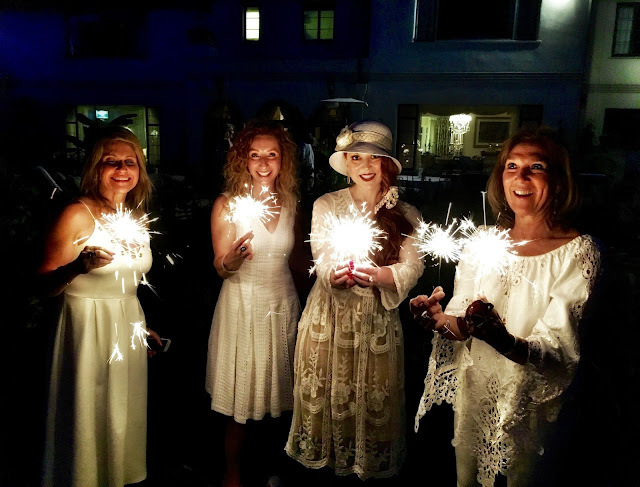 When the sun went down, torches, candles, and hundreds of sparklers continued to light the night with a warm white glow. 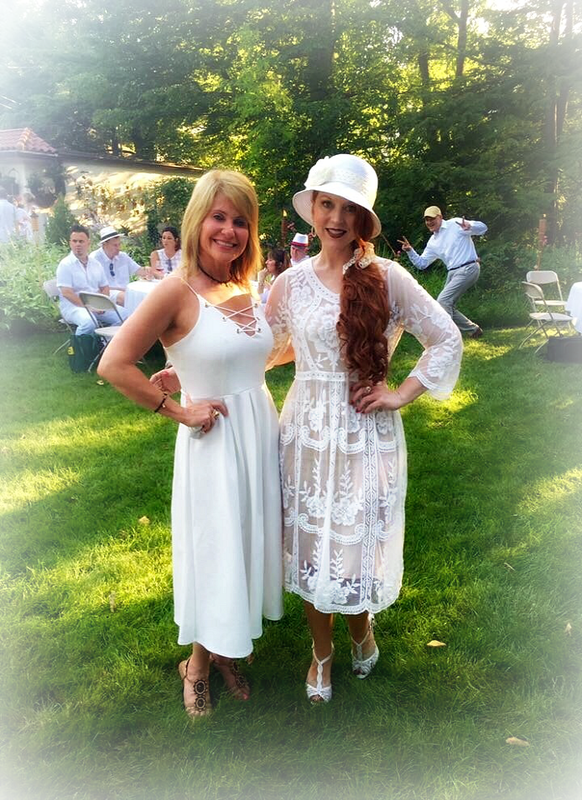 And despite the monochromatic color scheme, guests showed plenty of individuality in their attire. 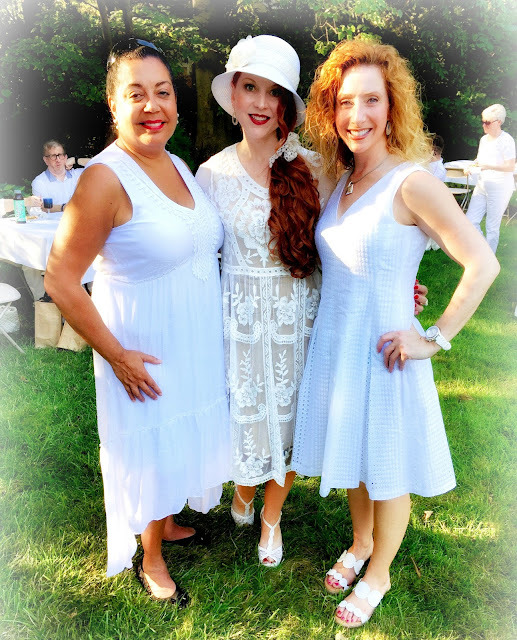 I've said it before, but there is just something about white clothing that exudes elegance. My own dress for this year's soiree sans color was a light as air embroidered lace number, perfect for the near 90 degree heat. I didn't think I would find another white dress that I liked as much as last year's (a caftan I discovered at a street market in India), but I was wrong. This year's soft white dress from Amazon is definitely one I'll wear again and again. Even better, it cost less than $20 - remember, more money does not necessarily equal more style! I'd be remiss if I didn't also mention my sandals and share a fashion insider's tip. These white lace heels from Amazon are incredibly comfortable despite their height. Wearing heels to a garden party is risky, particularly if the ground is soft. But, two years ago I discovered "Solemates," an inexpensive way to spare your shoes. Solemates are small plastic covers that slip unobtrusively over your heels and keep them from sinking into the ground like lawn jarts. Were it not for these little gems, my pristine white shoes would have surely been streaked with grass stains and dirt after last night's garden festivities. I have them in multiple sizes for different types of heels. You can find your own pair here. This post is also linked with Hat Attack! Elizabeth, thank you so much! I love hearing from other stylistas with similar viewpoints. Have a wonderful weekend! Love love love this article! The reviews were very detailed and I really liked the pictures as well. The last time I visited academized.com review Singapore, I didn't find any good places for it but this has helped me a lot!